I love making natural products for myself and my girls. There are just so many chemicals in our world and I think the more I can reduce that the better for our bodies. Of course, being a busy mom, I have to make things that are quick and make enough to last a while so that I'm not making deodorant every weekend. 😉 Today, I'm sharing how to make deodorant. 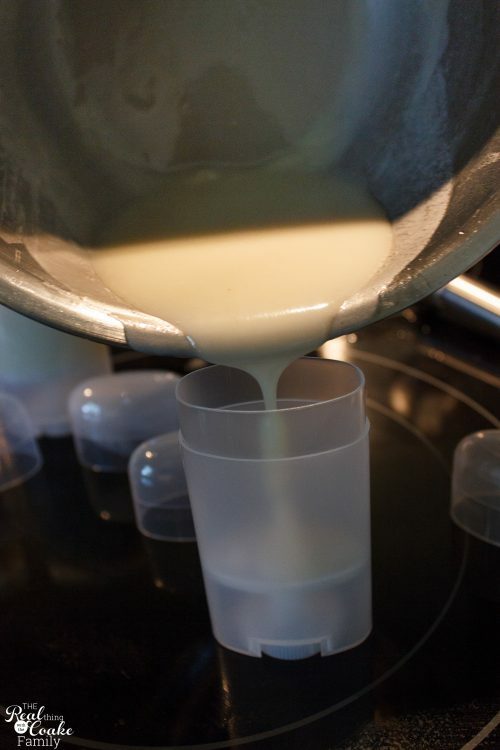 I've been experimenting with various natural products I can make for a long time, like the laundry detergent and lip balm, but I've also been making my own deodorant for years. I've been tweaking and changing the recipe for a long time. I finally have a recipe that solidifies and totally works and I'm ready to share it with you. Yay! If you have stepped into the realm of natural deodorant, you probably know what I mean when I say that NONE of them work. I know I'm not alone. 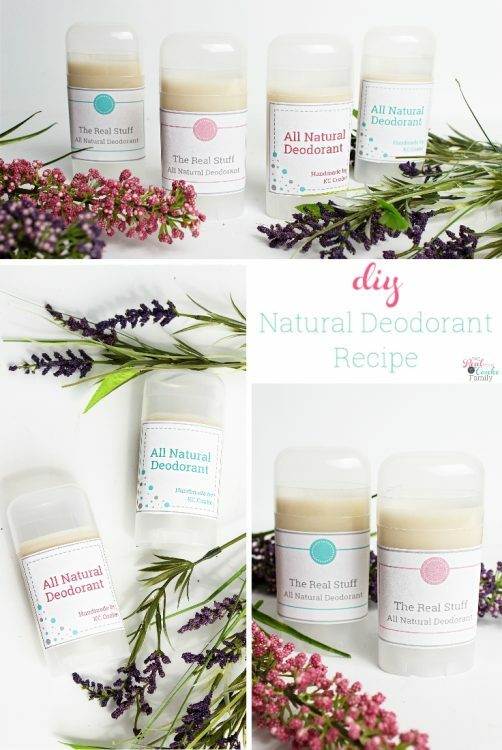 I've tried every single one of the natural deodorants that are for sale….well maybe not every single one, but I've tried a lot. Not one of them work. I know when I talk with the people at Whole Foods as well as friends, I am not alone. I started with a solely coconut oil based deodorant. I like it and it worked, but when we travel the coconut oil liquefies if it gets too hot (which was a problem on our 20104 road trip, part 1 – part 2). I switched to one that has a variety of different kinds of butter and oils and it solidifies and softens your skin as well. On top of that goodness, I add essential oils that help me not only smell good but are good to help possibly ward off cancer. You can read more about the Frankincense and Lavender essential oils and cancer here. One thing you will need to know is that this is a deodorant, not an antiperspirant. It will help you not stink but you will still sweat. I think that is good for our bodies as much as sometimes I don't like it in the humid summers. This deodorant will take you maybe 20 minutes to make and that is going from getting everything out to pouring it in the deodorant tubes. It is pretty quick. It makes 4 tubes of deodorant so it will last a while. As far as how to make deodorant, you will need a double broiler. 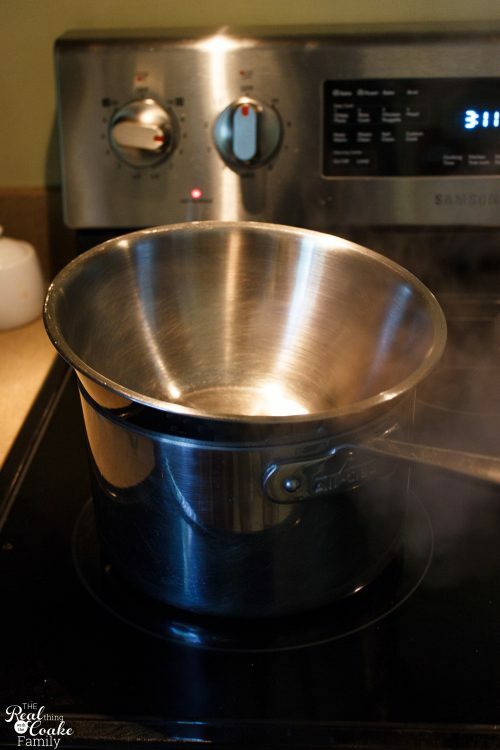 I just make my own, by placing about 1/4 pan full of water on the stove and getting it to a low bowl. Then I place a small metal mixing bowl on top. Works perfectly! You will add the Shea Butter(affiliate link) and Coconut Oil(affiliate link) and allow them to melt. Then you will add the Beeswax. 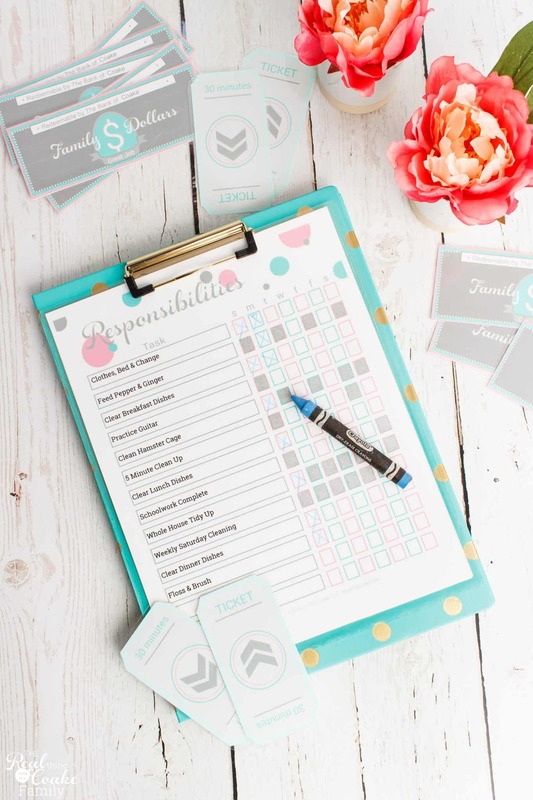 I have a full printable recipe for you at the bottom of this post. 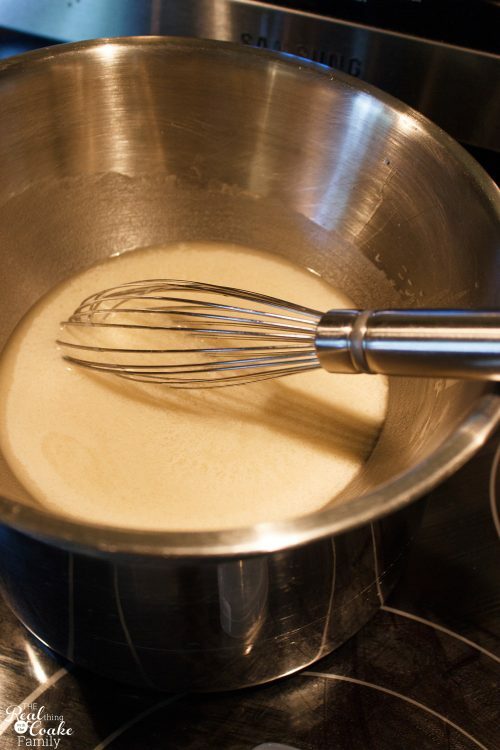 Then you will remove from the heat and whisk in the arrowroot powder(affiliate link) and baking soda until smooth. Finally, you will add in all of the essential oils and Vitamin E drops. Again, I have the recipe with all of the measurements at the bottom of this post. While it is still hot, pour into your deodorant tubes. I got mine on Amazon (affiliate link to the ones I have). You can also pour it into small mason jars like these(also an affiliate link). 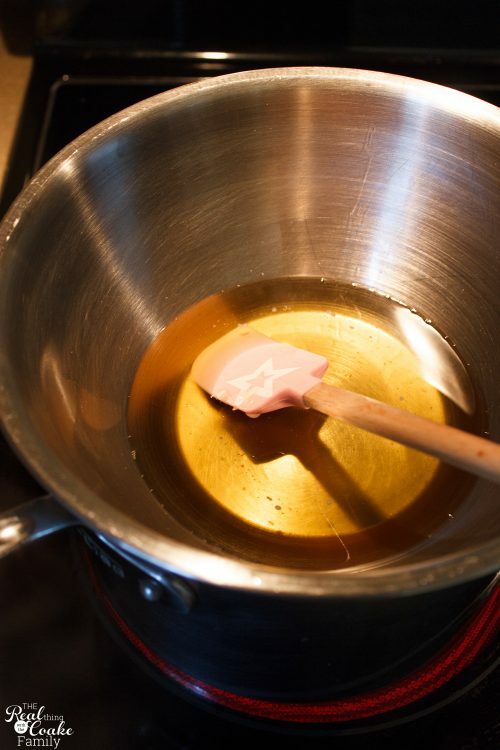 Stir up the mixture in between each pour to make sure you get even distribution of all the ingredients. The only time I've had an issue with the deodorant not working is when I haven't mixed well between pours and I don't have all the ingredients in that small section. Which if that happens and you have poured yours into mason jars, you can use your finger or a spoon and mix it up. With the deodorant tubes, I've been very careful to mix well and haven't had the issue yet. The deodorant will solidify as it comes to room temperature. 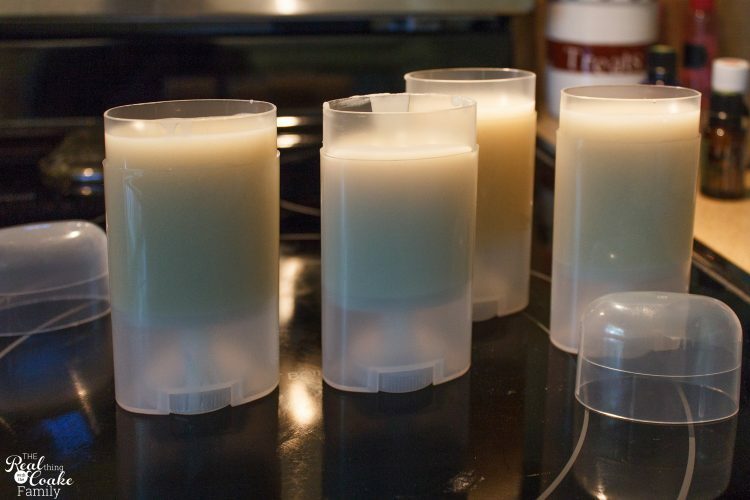 Wait to place your lids on your tubes until it is completely cool. While I realized it is totally not necessary, adding a label just makes it feel more like ‘real' deodorant. I find so many uses for the labels and tags and kitchen pantry labels! 🙂 They were super easy to print on full sheet sticker paper(affiliate link) and add to the deodorant when it was cooled. The hardest part was trying to come up with some clever name for the deodorant. lol! One note about the costs, I know that it seems expensive to buy the ingredients and get started. I hear you! I felt that way as well. However, I bought all of my supplies, some of which were for the lip balm as well, well over a year ago. I've made at least three batches of deodorant as well as the lip balm and I still have plenty to make more. You will get your money's worth out of the supplies. It is just more of an upfront cost that I think works out to be the same or less expensive than buying store bought deodorant for that same time period. As you can see, learning how to make deodorant super easy! I love that I know exactly what is going on my body. How about you? I love your website. I joined and received a welcome email but never received the printed instructions for making the deodorant. Please let me know how I can get the recipe to print it. If you wait just a minute (sometimes longer depending on your internet connection speed), right where you signed up that graphic will disappear and a new graphic will appear. The new graphic says, click here for your free recipe(or something like that). Just click on that link and it will take you directly to the printable and you can download it. Thank you. I did eventually receive it. I have one additional question. Is this deodorant for kids? Is there any adjustments in the number of drops for children? My granddaughter has just started using deodorant and I wanted to make something more natural for her since she is only 10. Thank you. We will try it and see what happens. Thanks for your contribution. I want to try this but can’t find the legitimate link to the recipe? Can you post or send the URL? Sorry for the trouble you are having. If you come back to the post and go to the box near the end of the post that says that this printable/recipe is a subscriber-only bonus, just sign into that box. Wait a little bit. The graphic will change from the subscriber-only box to a box that says click here for your free printable/recipe. Click on that box and the recipe/printable will open up in another window. You can then print or save the file to your computer. Love this deodorant! I have been using it for months now. Hi! I’m so excited to try this deodorant! I’m just really getting into natural everything and hoping to make everything from handsoap to dishwasher powder, laundry detergent….I’m so excited! I’m not sure how long ago you posted this recipe, but almost none of your affiliate links are working. Are you still making this deo? Do you still love it? I am a little overwhelmed by the vast number of deo recipes on the net and I’m not sure where to begin, but yours sounds great and is slightly cheaper to make than some that include so many expensive oils, so I think I’ll start here! I’m so glad you found the recipe! I hope it works great for you. That is funny that the links aren’t working for you. They work perfectly fine for me. I’m double checking one technical thing to see if that is the issue, so if you want you can try them again and see if they work now. There are SO many recipes, you are correct! I ended up blending my favorites together into this formula that works really well for me. I do still make it, though I must admit that in the heat of the summer, I go back to traditional deodorant, not because this doesn’t work but because with the humidity where I live I like the antiperspirant in the heat of the summer. Good luck on your journey! I am not able to get the re ipe for the deoderant. Would you please email it to me? I’m super happy to have found this recipe. I only have one question, how many ounces approximately be the amount of coconut oil? It’s just that oils don’t solidify where I live because of the hot and humid weather. I’m not really sure, but I did a quick Google search and it says it is 1 ounce. HTH. ?